Have you ever considered that the United States Constitution may not be the solution to America’s problems, but rather the source of those problems? My name is Reverend Steven Louis Craft. I’m a Christian Clergyman and one who is greatly concerned about the spiritual and moral decline in our nation. I believe it is my Christian responsibility, before God, to uphold Christian principles in every area of life-including government. I believe that Christians who are looking to create a Godly government by promoting the US Constitution will not be able to accomplish this goal. Why is that you may ask? It is because the Constitution is not a Christian document, but is actually antagonistic to Christianity, and conflicts with Yahweh’s Sovereignty and Morality! You may be asking how can I say this, when so many sources declare that the Constitution is a “biblical document” created by “Christian men”? Have you ever studied the Constitution and compared it to the Scriptures? I have and now repent because I, like many others, have believed a lie! How can a document that promotes the “will of the people” over the Will of God for His people be the answer to America’s spiritual and moral decline? I believe we can find within the Scriptures the spiritual keys that made America great! These are the same keys that can restore our nation to her true Christian beginnings, and I want to share them with you! 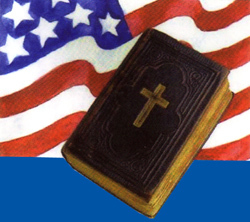 I invite you to contact me at slcraft1@verizon.net in order that we can restore our nation by promoting the seminar entitled: BIBLE LAW vs.THE UNITED STATES CONSTITUTION. If I can serve you in this most crucial matter, feel free to email or call me at (732) 682-2741 for more information.